This one my son and I made together to start a tradition in our family. I found the story online and made the ornament to go with it. As I didn't want to purchase the more expensive glass ornament on line. 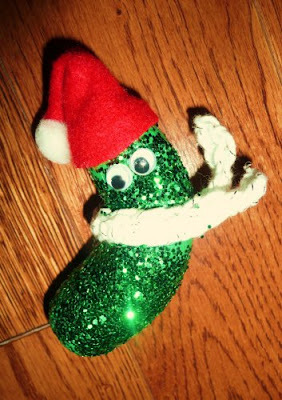 In Germany there is a tradition started about a pickle ornament. 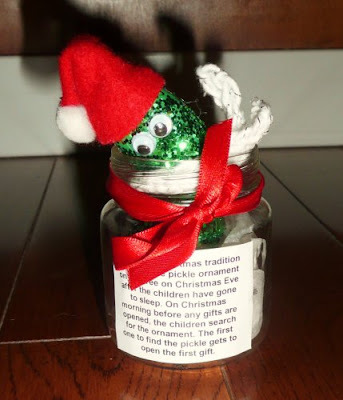 On Christmas eve when the children have gone to bed, the parents hide the pickle in the tree. When the children wake up they must search for the ornament before any gifts can be open. Whoever finds the ornament first gets to open the first gift. The pickle is made from a baker's clay recipe (1 cup flour, 1/2 cup salt, 1/2 cup water, mix and knead for ten minutes, bake at 300 for an hour or until slightly golden brown on the edges). This recipe will make more than one pickle, so you could make them as gifts or use the rest of the dough to roll out and use cookie cutters and bake and paint for other ornaments. I just took approx. a tablespoon size amount of dough, maybe slightly more but not much. Shape into a pickle shape and bake. Then we painted it green, let it dry. Painted it with glue and covered it in green sparkles. The hat I made from a small triangle of felt and a pompom. Glue on eyes. I hot glued a small loop wire at the back and then hot glued a scarf around and covered up the bottom of the loop to hide rough edges. I crocheted the scarf but you could just use felt or small piece of fabric. I used a baby food jar as a nice little holding spot for it, with tissue paper at the bottom, a note about the pickle on the side and red ribbon. Copyright © 2009 by Kelly Yarocki of BC, Canada. All rights reserved.